The states planning to sue to protect net neutrality. 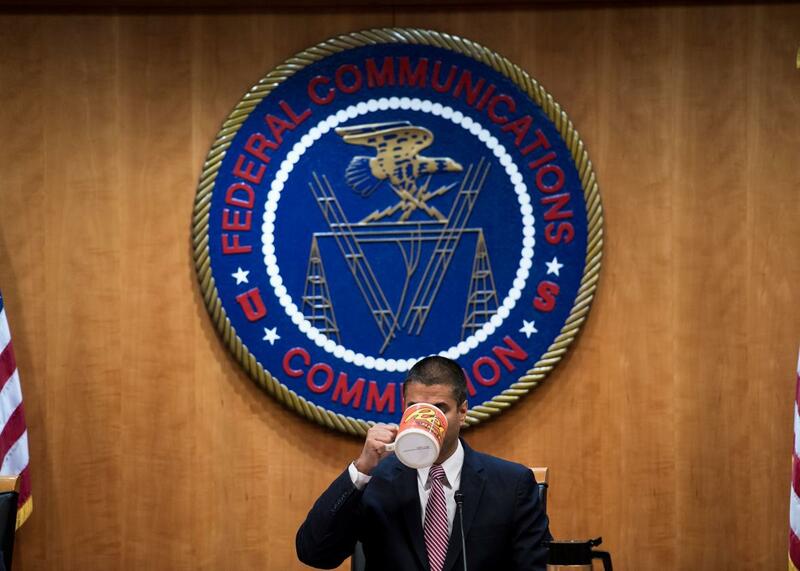 FCC Chairman Ajit Pai taking a quick caffeination break before moving to gut the open internet rules. Update, June 11, 2018, 11:48 a.m.: There are now 22 state attorneys general planning to sue to restore net neutrality. Original post below. Net neutrality suffered a critical blow on Thursday after the Federal Communications Commission voted 3–2 to repeal the network neutrality rules that prevented internet providers from blocking or throttling access to websites or charging websites to access users at faster speeds. But the battle is far from over. Just hours after the FCC vote, the first state attorneys general promised to sue the FCC for moving forward with the net neutrality repeal even though the public input process was rife with fraudulent entries, including the use of stolen identities, comments from bots, and submissions from suspicious Russian email addresses. The multistate challenge is helmed by New York Attorney General Eric Schneiderman, whose office has been leading the charge against the FCC’s comment-process problem. So far, his investigation has found more than 2 million comments were made using stolen identities. Schneiderman contends this is a violation of New York state law, and his office set up an online tool to allow you to check whether your identity was used to submit a comment to the FCC about net neutrality without your knowledge. Attorneys general from Washington, Illinois, Kentucky, Pennsylvania, Delaware, Oregon, Vermont, the District of Columbia, and Massachusetts have also announced plans to challenge the FCC’s net neutrality repeal. “There is a strong legal argument that with this action, the federal government violated the Administrative Procedure Act,” Washington state Attorney General Bob Ferguson said in his statement. “We will be filing a petition for review in the coming days.” On Wednesday, attorneys general from 16 states and the District of Columbia sent a letter to the FCC requesting the vote scheduled for Thursday be delayed until the agency could suss out exactly what went wrong with its comment process. (Of course, that didn’t happen.) Many of those states might end up suing, too. A widely circulated tweet claims that, in total, 17 states are already planning to sue, but not all of those states have released official statements on their websites or on Twitter about any such plans. I reached out to the attorneys general who signed Wednesday’s letter but have yet to make public statements and will update this post when we hear back. It’s not just attorney generals lining up to sue the FCC. Free Press, a nonprofit that supports net neutrality and opposes the repeal, told me it plans to mount a legal challenge. The National Hispanic Media Coalition is also planning to challenge the FCC’s removal of net neutrality protections. “Chairman Pai’s repeal of net neutrality rules is a frontal attack on Latinos and other communities of color, who already face substantial barriers in getting online, staying online, and having high quality Internet,” said Carmen Scurato, vice president of policy at the coalition. They will have a pretty strong case. According to the Administrative Procedure Act, federal regulatory agencies have to engage in a public comment process before finalizing new federal policies, but, as Schneiderman has found, the process leading up to the net neutrality repeal was so ridden with fraud that it might not have given the public a fair shake at airing their concerns. And that’s just one problem with the process. Legal experts told me there are numerous legal holes in Pai’s net neutrality repeal. For one thing, it’s not clear whether the old rules were actually faulty. Furthermore, his move to wipe them away could be read as arbitrary and capricious, meaning his rule change might not hold up in court. But the important thing to remember is that going to court doesn’t mean a judge will grant an injunction on the rules. Without an injunction, internet providers can still move forward with opening up internet fast lanes or blocking access to websites while the legal challenges make their way through the courts. In other words, this net neutrality roller coaster isn’t slowing down anytime soon.